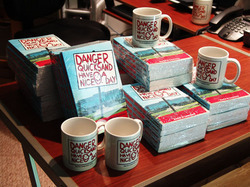 The coffee cups are going to those of you who ordered multiple copies of the book. They look great. I will continue that premium offer if your interest continues. I am going to be very busy today packing and shipping books and mugs. Thanks to all who have helped by hosting ads, mentioning my book on your blogs or by ordering books. Your books will be going out today. Update: I have already taken a bin full of books to the post office and they are on their way to those of you who pre-ordered them. I am now working on sending out books to all who provided quotations for the book or helped in some other way. UPDATE: The UPS man came again. This time with a truckload full of boxes. All mine…!! If this continues, you either need to move to a bigger house or quickly start selling loads of books. I think you prefer the last option 🙂 Good luck. Congratulations! I need to come back here and spend some time reading all your posts on self-publishing. You certainly serve as inspiration, David, and I wish you the best of further luck because you’ve already started making your own. does the bentcrowpress.com link on your blog (which still says “preorder by April 30,” btw) help empty your house or ship straight from elsewhere? Thanks for your interest and helpful comments. Steven, I have changed all of the ads on my site to say “order now” but there are other sites which have not received updated blog ads from me. I created Bent Crow Press and I am warehousing this first printing here at my home in Palmyra because I am signing every copy in this first printing and will shipping about a hundred books for promotional purposes.